Locke wanted to apprehend the transporters, interrogate them and set up a raid on the locations in Everlight where the kidnapped victims were held. A colossal waste of time as far as he was concerned. He conceded that Locke’s whining about his non-cooperation held some truth. He hadn’t cooperated, but then Locke hadn’t even considered working the case from his angle. With what Silk was beginning to consider Locke’s MO—everything the man did lacked thorough planning—Locke had charged off, engaged in an ill-conceived cowboy shootout, screamed at him to chase the perp down, then stormed after the suspect and KO’d himself. Silk’d had to abandon his stealthy pursuit and watch the perp vanish through a transient portal into Elysium. Yeah, he had a few things he wanted to say to Kavaliro and Chief Hocinka about his Everlight ‘partner,’ like, how soon could he be reassigned? With a groan, Locke leaned over and pulled the car door shut. Locke turned his bloody face toward Silk and snarled. With a chuckle, Silk started the engine, put the car in gear and drove to St. Mercy in blessed silence. "A pang echoed through Silk. He might not want the wizard...but he wanted what the man had—a partner, a true partner in every sense of the word." There is world of difference between Everlight and Elysium, but the one thing they have in common is the language of love. In Everlight it is normal to love 'em and leave 'em. In Elysium, once you have declared your intents, you are forever bound by the Eternal. But what happens when two people, each from the two totally different worlds, fall in love? "Loneliness threatened to overwhelm him, but he shook it off, and the bright color Tony had injected into his life resolved to gray. He knew how to do gray. It was the vivid colors of hope he couldn’t handle." Tony is a ragged and tough police man. When paired with Silk, a monk from Elysium, sparks are instant. But Silk cannot stray from his vows, and Tony will not make him, no matter how much he wants Silk. When a task, that reaches Tony on a personal level is given to both men, they create a bound so tight, nothing will tear them apart. And when Silk receives tragic news, the life he's has only known will been turned upside, and Tony is there to help him upright. "Somehow, the man worked himself down next to him, wrapped his arm around his waist in a tight hug and spooned him—and for the first time in over one hundred years, he knew the solace of another body next to his." 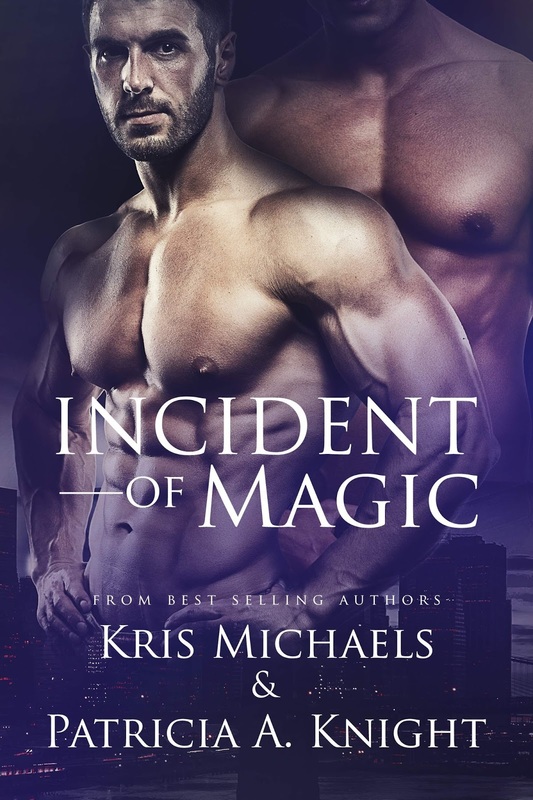 Incident of Magic is hot!!! HOT!! Kris and Patricia are solid together, and create such a stunning environment for readers, that it feels like you are right there in the book! And the relationships that they write about are face-fanning, thigh clenching delicious! And always a fan of returning characters, Incident of Magic did not disappoint! Thank you for taking the time to review our work. We are honored by the kind words of praise. So glad you were entertained by our boys. Thanks for all you do to promote them.